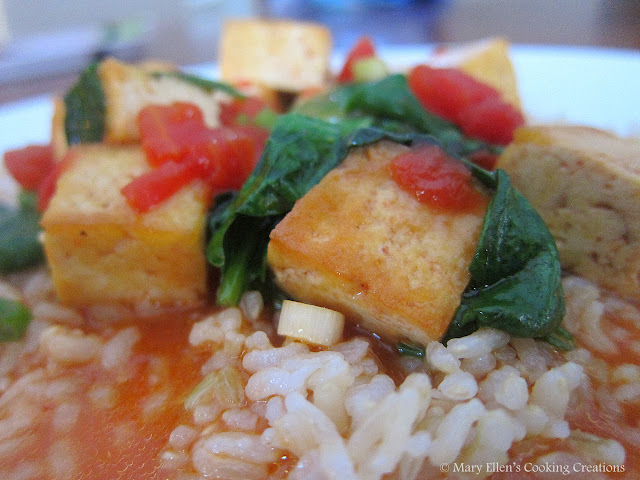 To me, tofu is the ultimate ingredient for a quick and easy dinner. You don't have to worry about cooking it to a certain temperature, it cooks quickly (or it can simmer for a bit to soak up more flavor), and it is so versatile that you can really use it with any flavors. I usually choose to prepare it with Asian flavors and ingredients, but have also tried Mexican and Italian flavors as well. Tonight I didn't have much time to cook, and I only knew I would be making tofu. I opened the fridge and did my favorite thing - started grabbing ingredients to use to come up with a quick tofu dinner. I spotted a bottle of Ponzu that Jon bought last week. We never used it, so I opened it, gave it a quick taste, and based the rest of the dish on it. Ponzu has a soy flavor with great brightness since it is citrus based. It isn't as heavy as soy, but still adds that basic flavor and saltiness. Along with the ponzu I also used a touch of soy sauce, Sriracha sauce, mirin as well as tomatoes, garlic, green onions, and spinach. This dish came together in about 15 minutes, and had a great spicy and tangy flavor. My daughter even ate the rice that was sitting in the sauce and loved it. I served it over Trader Joe's Organic Brown Rice that I buy in the frozen section - it cooks in THREE minutes in the bag it comes in (no extra pot to clean!) and it's good! Press your tofu - if you know you are making tofu for dinner, take it out a few hours early, remove it from the container with water, and wrap it in paper towels or a clean kitchen towel. Press gently, and put it in a dish in the fridge with something on top of it, such as a block of cheese. This will get all of the extra water out and let the tofu absorb more flavors. 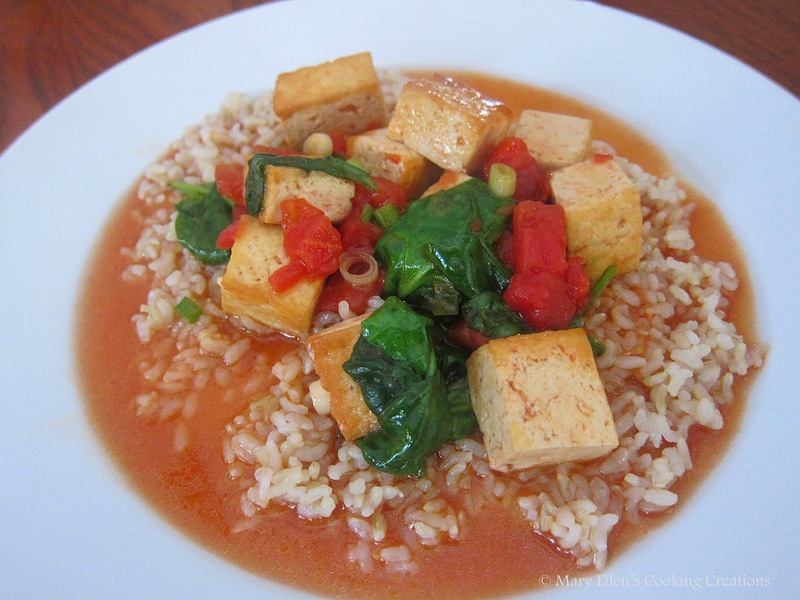 Once you are ready to cook, cut the tofu into cubes. Heat the oil in a large sauté pan or wok over high heat. Add the tofu and sauté 5 minutes until browned on all sides (let it sit on each side for a minute or so, don't constantly flip it around - you'll get a better crust this way). Add the tomatoes and stir; let cook for one minute. Add the garlic, and then pour in the ponzu sauce, soy sauce, mirin, and sriracha. Bring to a simmer for 5 minutes. Taste and adjust any of the flavors before adding the slurry (broth mixed with the flour/cornstarch). Let simmer 2 minutes before serving.